Beans are really hard to digest. Unlike many foods which contain mostly one of the three macro-nutrients (fats, carbs, protein), beans are balanced (and not in a good way), containing a fair amount of each. To complicate things, the carbohydrate in beans is in part in the form of starch. Carbohydrates take less than an hour to digest alone, yet proteins and fats take multiple hours to digest, even when eaten alone. Macro-nutrients each require different digestive enzymes. Proteins mostly require acid enzymes, and carbohydrates and fats mostly require alkaline enzymes. What happens when alkaline enzymes and acid enzymes meet in the stomach? Your stomach must secrete pepsin to digest globular proteins. Pepsin can function only in a highly acidic medium, which must be maintained for several hours. Ptyalin and other alkaline juices are required to digest starchy foods such as sweet potatoes. The typical sandwich requires both alkaline and acidic enzymes for digestion. Bread is starchy, and meats and nut-butters are high in globular protein. Acid and alkaline juices are secreted simultaneously in response to the incoming protein and starch, promptly neutralizing one another and leaving a weak, watery solution in the stomach. Proteins putrefy and starches/carbohydrates ferment. This putrefaction and fermentation is one cause of disease. It leads to gas, acid reflux, bloating, constipation, and so on. However, you wouldn't have this problem if your gut lining was completely intact and you had plenty of healthy gut flora to break down the beans for you. The thing is, you – your human cells – can't digest beans on their own. You're not equipped to do so. However, friendly gut bacteria are. Unfortunately, few people today have intact gut barriers and gut flora. Ironically, beans themselves are part of the problem. Not only are beans difficult to digest because of their balance of starch, protein and fat, but also because they are very high in lectins. To understand lectins better, let's look at one of the most toxic bean of all: the kidney bean. Raw kidney beans contain relatively high amounts of phytohemagglutinin – a lectin – and thus are more toxic than most other bean varieties if not pre-soaked and subsequently heated to the boiling point for at least ten minutes. The US Food and Drug Administration recommends boiling for thirty minutes to ensure they reach a sufficient temperature long enough to completely destroy the toxin. Cooking at a lower temperature (below 80 °C / 176 °F) can increase this danger and actually raise the toxin concentration. Just a few raw kidney beans can kill a full-grown adult. While most beans don't contain high amounts of phytohemagglutinin, specifically, that's only one kind of lectin that seeds contain to discourage animals from eating them. Gluten (in rye, wheat and barley) is another example of a lectin. These lectins actually contribute to creating leaky gut. Other contributors of leaky guy include candida, endocrine disruptors (BPA, polyester clothing, receipt paper, etc), NSAIDs (like ibuprofen) and genetically modified foods (most conventional papaya, alfalfa, soy, cotton, corn and yellow summer squash). Many 'allergies' are a direct result of lectins, which are then exacerbated by poor food combinations. The bloodstream gathers toxins from the putrefied, fermented mess as it passes through the intestines, and these toxins in turn cause hives, headaches, nausea and other symptoms commonly branded as allergies. The average American male today carries about five pounds of undigested, putrefied red meat in his gut. Leave five pounds of meat in a dark, warm, moist place for a few days and see for yourself the results of putrefaction. The solution is to heal your gut, restoring the lining of your small intestine. In order to protect itself from lectins and other irritants, the colon secretes large quantities of mucus to entrap toxic particles before they damage the colon's lining. When this occurs three times a day the colon becomes lined with a constant thick mucal lining. This lining slowly seeps toxins into the rest of the body. Worse yet, all this undigested food, mucus and gas expand parts of the colon unnaturally. We call this diverticulitis (stretched out pockets of colon where food and bacteria remain for long periods of time). Diverticulitis can then lead to mega-colon, colitis, irritable bowel syndrome, and/or colon cancer. Aren't beans one of the most efficient sources of protein? "I would have to eat almost one and a half gallons of chopped watercress in order to get the protein I receive from ½ a cup of black beans. Isn't it more logical to have a diet that includes beans?" Most people today (especially those of us in the United States) have serious digestive problems from eating so much toxic garbage (aspartame, corn syrup, agave nectar, splenda, MSG, colorings, artificial flavorings, hydrogenated oils, canola oil, and so on and so forth). These digestive problems make eating beans tantamount to disaster. A weak digestion can not effectively pull beans, legumes, nuts, seeds or grains. Proteins in these foods are bound up balls of amino acids that are terribly hard to pull apart. Also, almost all seeds are rich in lectins as a protective measure. Dr. Weston Price warns against a diet rich in seeds (including beans) due to phytic acid, which is known as an anti-nutrient. He showed how cultures lost their healthy teeth when they converted from a diet of raw milk, fish, and vegetables to a diet rich in seeds (grains and beans) instead. Now, many decades later, Dr. Gundry has discovered the damaging effects of lectins in seeds. Whether you're trying to build muscle, lose weight, improve your skin, or increase your energy levels – beans are not your friends. Dense proteins have to be broken into amino acids and then rebuilt into proteins again in the body. When you consume amino acids that are not bound into proteins then you absorb them immediately and easily. The difference this makes for people with a weak digestion, or for athletes trying to build muscle is tremendous. Amino acids found in fruits and vegetables are not dense, bound or globular. Rather, they are readily assimilated by the body. Many athletes are including more raw food because of the enhanced recovery time and the quicker muscle building. There are athletes who eat nothing but fruits and vegetables and are incredibly strong and healthy. You don't need seeds or animal products to be strong, energetic and healthy. However, most people wish to consume foods besides raw fruits and vegetables. For this reason, I recommend ground flaxseed which is relatively low in lectins, Green Pasture's Royal Blend (a mixture of fermented cod liver oil and butter oil) or perilla oil for vegans, only pressure-cooked beans (and only after you've healed your gut), millet (which is low in lectins and has no gluten), wild-caught fish, raw milk from A2 animals (not A1 cows) fed exclusively grain-free diets, and duck egg yolks from ducks who have never been fed grain. Anyone with acid reflux, candida, weight issues, high toxicity exposure (like a smoker), IBS, diverticulitis or any colon complications should not be eating beans until healed. Healing fully from one of those conditions can take many years depending on treatment used and severity of the condition. Some people can heal in as little as six weeks when following strict gut-healing protocols, avoiding all lectins, consuming plenty of antioxidants, and long-chain fatty acids (DHA and EPA). I've met few people in my travels who don't have at least one digestive problem. Even the Paleo diet does not recommend eating beans because our ancient ancestors would not have been able to harvest and prepare a lot of beans in a nomadic culture. Speaking of which, history shows a dramatic decrease in the average health of humans after the advent of agriculture. When we were foragers our diets were primarily raw fruits and vegetables with the occasional fish or other animal. After that, our diets became primarily seed-based. To understand why beans are so hard on the digestive system it is important to know about how long it takes to digest various food types. Meats, diary, nuts, avocados, seeds and eggs take around four hours. Vegetables take around two hours. Most fruits take about one hour. Melons take around twenty minutes. The above is altered by the volume of food consumed, your health, and any food combinations. It's very important to let your stomach be empty between meals. Problems that can arise by eating when your stomach already has food in it: gas, acid reflux, lack of nutrient absorption, stomach cramping, inability to lose weight, inability to gain muscle, hormonal imbalance and more. If you mix fruit and beans at the same meal then the entire meal will take six hours or more to digest and will likely give your body a very hard time. Someone with stomach ulcers, IBS, severe candida, etc, should not be mixing any of the above food groups in general, except with a few things like lemons and lettuce which can be added to almost anything safely. If you're not done digesting when you go to bed you won't sleep well. Personally I get circles under my eyes if I am not done digesting before I go to sleep. Hormones that replenish our bodies, burn fat, repair muscle, etc, do not release efficiently when insulin is present. Insulin continues to be present until we've finished digesting our food. When we eat before bed we digest food instead of healing. This results in fatigue, sore muscles (that didn't recover/heal), aching joints, and so forth. A very large portion of people never get good sleep and never detoxify their bodies because they eat heavy meals in the morning and in the evening. You will not detoxify your cells or get good sleep while digesting globular proteins found in beans, nuts, and seeds. Because beans take so long to digest, this means they should then optimally be eaten six or more hours before going to sleep. And, because eating something like fruit while the beans are digesting would cause fermentation, gas, and other problems, nothing then should be eaten until bed. This makes beans seem rather impractical doesn't it? Eat (pressure-cooked!) beans at noon, and then eat nothing for the rest of the day. If you can do that, then sure, beans have an almost decent amount of nutrition for their amount of calories. In truth, eating one large meal a day is actually very good for you. It trains your body to burn fat instead of sugar, which is more efficient and prevents the fueling of cancer cells. Intermittent fasting (not eating for 14 to 22 hours out of each 24 hour cycle) helps your digestive system heal. However, beans are plainly inefficient nutritionally. They pose a hazard to your body while offering little nutrition-per-calorie. Regardless of how many meals you eat in a day, or when you eat them, you're going to crave a fairly similar amount of calories each day, so the important thing is to optimize your calorie intake for nutrition. That said, what you take out of your diet and lifestyle will have a far greater impact than what you put in. If you remove lectins, refined sweeteners, processed foods, endocrine disruptors (BPA plastic, polyester clothing, etc), genetically modified foods, conventional (chemically sprayed) food, and drugs, you will have incredible results. It doesn't matter as much whether you're eating a high fat diet that is primarily avocados, wild-caught fish and hemp-seed oil, or whether you're eating a diet that is low-fat, high-carob that is primarily local, ripe, organic fruits and organic vegetables. If someone really needs some more calories because they are absolutely too busy to eat enough vegetables then I recommend consuming organic, vegan yogurts based on coconuts or almonds. Fermented products are beneficial to the overall micobiome of your body, and coconuts, thankfully, are not a source of harmful lectins. (Almonds have some phytic acid and lectins, but it is primarily in their skins. By soaking and peeling your almonds, you're on the right track.) You can also snack on organic olives which are source of healthy fats, making them satisfying. Carrot juice is a great source of calories on a detoxifying raw vegan diet. One measuring cup of carrot juice provides 100 calories, as well as 17% of all the nutrition needed for the entire day (including amino acids). That one cup of carrot juice also provides more than a day's supply of beta-carotene, a powerful and important antioxidant. Visit my Appliance Recommendation Page to see which juicers I recommend. You may also eat sweet potatoes and cassava flour as sources of lectin-free calories. Of course, virtually any ripe, organic fruit can be consumed for calories. Why am I talking about sources of calories? Because that is what beans are. We have stored beans, nuts, seeds and grains for thousands of years because they weren't as perishable as fruits and vegetables. They allowed us the bare needs for survival through winter, famine and failed crops. In fact, new evidence suggests that we started incorporating more seeds because they helped us fatten up, and thereby helped more of us make it through the winter. "Staple foods" are just foods that we can store easily and consume for calories so that we don't die in extreme conditions. Unfortunately, most "staple foods" consumed in excess on a daily basis cause disease. Too many potatoes will cause constipation, too many beans can cause gastritis, too much meat can cause an array of cardiovascular problems, too much grain (especially brown rice, rye, barley, oats and wheat) can result in bacterial problems and leaky gut. Interestingly, our ancestors always removed the hull. They were on to something! The hull is where most of the phytic acid, lectins and other undesirable stuff is. Turns out that white rice is actually better for you than brown rice. Nevertheless, it is still a source of calories – not nutrition. When it comes to high-calorie foods it is best that we rotate sources. If you feel that you should consume some beans, lentils, nuts, seeds, and so forth, that's fine – if you use a pressure cooker and limit the quantities you consume. What is important is that these foods are not consumed in high volume or too frequently. I suggest a single nut a day, a tablespoon of seeds (preferably flaxseed or sesame seed) per day, and if you choose to include beans or lentils, then consume them once a week to once a month. Who Can Eat Beans Healthfully? Beans are great for people with absolutely no digestive problems who are very active. If you never have muscle cramps, low energy, depression, stomach aches, headaches, hormonal problems or skin problems, then feel free to eat as many pressure-cooked beans as you feel like eating. If your health is that good, the chances are that you're very in touch with your intuition. Related Article: How to tell the difference between cravings and intuition. People who are out and about all day along (breathing in fresh air), on their feet, and don't eat any processed foods whatsoever can eat beans daily if they like. Many traditional cultures knew to soak their beans thoroughly and rinse them several times to remove all the enzyme inhibitors (which are present in all seeds to prevent them from spoiling before it is time to sprout). Enzyme inhibitors inhibit digestion. Just like they also knew the benefits of hulling their grains and fermenting most seeds before consuming them. Soy beans are fermented into natto, miso and temeph. Wheat is fermented into sourdough bread. Natto, as it turns out, is one of the highest sources in the world for vitamin K2 and subsequently, the culture that consumes natto on a daily basis has zero instances of hip fractures in their elderly. Note that vitamin K1 and vitamin K2 are very different. Vitamin K1 coagulates blood. Vitamin K2 tells your body where to put calcium by being the critical factor in creating the transportation mechanism for calcium. Without enough vitamin K2 you end up with calcium in your arteries (high blood pressure) and not enough calcium in your bones (cavities, bone loss). When vitamin K1 is consumed in tremendous quantity, you can convert vitamin K1 to vitamin K2. Eating two to seven pounds of leafy greens per day is considered sufficient for keeping bones healthy. If you don't have time to eat a huge salad each day, add leafy greens to a smoothie in the morning and have a large salad with dinner. Or, more realistically for most people today, you can supplement or find a source of raw diary that comes from grass-fed animals. In my case, I make an order for raw goat cream and other products from an Amish farm every six weeks or so. Look for buying clubs or opportunities to buy a share of an animal herd, as it is not legal to sell raw milk in most of the United States. To up my intake of vitamin K2 even further, I also supplement with Wiley’s Finest Vitamin K2 supplement which is also a source of long-chain fatty acids required for building healthy brain cells and intestinal lining. There is also some K2 in the supplement I mentioned earlier in this article, Green Pasture's Royal Blend as well as vitamin D and performed vitamin A. If you adopt this process of soaking and pressure-cooking beans, lead an active lifestyle and following the practices listed in the next section, you can be someone who can eat beans healthfully. Eat beans at least six hours before going to sleep. Eat beans on an empty stomach (after any previous meals have digested). Soak dry beans for two days before cooking. Soak beans in drinking water, rinse thoroughly after twenty-four hours, soak in fresh water for another day and rinse thoroughly again before consumption. Cook beans thoroughly in a pressure-cooker, so that they are quite mushy. Do not cook with salt, as this will inhibit the breakdown process and the beans will never become mushy. Why Have We Been Told That Beans Are Healthy? The other reason the health benefits of beans are touted is because many traditional cultures, such as Native Americans, ate a lot of beans. They did this for survival through drought and blizzards, not because beans are some magical food. Proteases are enzymes that digest proteins. Examples of proteases that are used in the human body include Pepsin (an enzyme in the stomach) and Trypsin (an enzyme in the small intestine) which digest proteins into amino acids, or polypeptide chains composed of amino acids. Casein (a protein in milk which makes up about 80% of the protein in cow's milk and 40% of the protein in human milk) is 4.6 (on the pH scale), for example. Casein A1 has been shown to be one of the large reasons people struggle with dairy consumption today. The other factors are the milk being cooked, and the animals being fed unnatural grain-rich diets. To consume milk healthfully, opt for milk that is casein-A2 (from brown cows, sheep, goat, etc), raw, grass-fed, and full-fat. Digesting dense globular proteins requires pepsin enzyme production in the stomach which requires a very acidic envirnment over many hours for full assimilation. Alpha-amylase enzyme facilitates digestion of amylose and amylopectin, two types of carbohydrate. Amylose and amylopectin are starches, or polysaccharides, consisting of thousands of chemically-joined glucose (sugar) molecules that must be disassembled into single glucose particles in order to be used by body tissues. The initial activity of salivary amylase is limited to the time food spends in the oral cavity. Amylase is active at a relatively neutral pH, around 6 on the pH scale. Ptyalin is an alkaline enzyme used to digest starch. Lipase enzymes are the kind that digest fat. The lipase enzyme created by the pancreas is alkaline, although there are also some forms of lipase that are acidic. The above examples are far from average in either fat or protein or both. However, most fruits and vegetables we commonly find at grocery stores land within 3% of the average. So most vegetables get 17% to 23% of their calories from protein. By combining a healthy mix of fruits and vegetables, you can get enough fat and enough protein without any other foods. 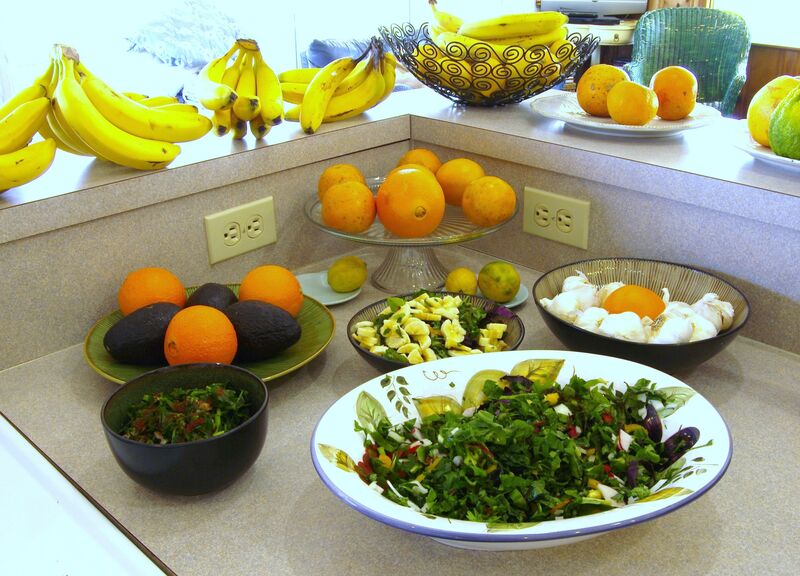 It is possible to eat a completely raw diet of just fruits and vegetables and meet all of your needs even "on paper." A note of caution however: unripe fruits and nightshades are also sources of lectins. They don't contain as much lectin content as seeds, but if you're seeking a raw food diet to heal your digestive system, steer clear of tomatoes, peppers, tomatillos, ground cherries and eggplants. Focus on kim chi, sauerkraut, lettuce, and ripe in-season fruits. I have compiled the nutritional information from the USDA on over one hundred different produce items in comparison charts that compare things by their type. (Fresh herbs is one chart, cruciferous vegetables another chart, root vegetables another, and so on.) It is way more information than one can simply memorize, which is why I made super easy reference charts so that you can find the answers to complex nutrition questions in seconds. These charts are exclusively available in my book The Ultimate Nutrition Reference. If you're really convinced you must eat more protein, you can get extra amino acids from sprouts (but avoid bean sprouts), spinach, watercress and kale. One can even emphasize protein-rich fruits such as mulberries (available dried and raw from Nutiva's Naturals) and raspberries. However, it is unlikely that you need to emphasize protein, as I explain in my article all about protein. Beans aren't needed for their protein content on a vegetarian, vegan or raw vegan diet. In fact, I've had clients whose main issues stemmed from bean consumption. The majority of Americans are suffering from some gastric distress, and for these people I don't recommend eating beans at all. It worsens conditions such as constipation, IBS, candida, diverticulitis, stomach ulcers, colon cancer and colitis. If you have symptoms such as gas, abdominal pain, acid reflux, bloody stool, or painful bowel movements then you should not be eating beans – or any lectin-rich foods, which includes most seeds, grain/seed-fed animal products, nightshades and under-ripe fruit. All of that said, pressure-cooked beans are still a a healthier option than conventional breads, pizza, soda, candies, aspartame, canola oil, conventional meats, conventional dairy, and processed foods. If you have to choose between a typical pizza and a plate of pressure-cooked lentils, especially if this is a conventional pizza versus organic lentils, then absolutely go for the lentils. The sources for this article include: The Plant Paradox by Dr. Gundry, Cure Tooth Decay by Ramiel Nagel Pancreatic Juice, Pancreatic Lipase Enzyme, About Protease, Wiki on Protease, Food Combining, Digestion & Enzymes, Casein.